DTCC will participate in a number of panels at the upcoming 2019 SIFMA Ops Conference, May 6 – 9 in Boca Raton, FL. For 46 years, SIFMA’s Operations Conference & Exhibition has gathered operations, technology and regulatory leaders from across the securities industry to collaborate, share information and address challenges. As the industry continues to evolve in response to policy, risk, technology and regulatory changes, Ops 2019 will delve into the dynamic and complex environment that is reshaping operations, the customer experience and market requirements. DTCC speakers will be involved in panels on clearing and settlement, customer account transfer and the bulk transfer initiative. 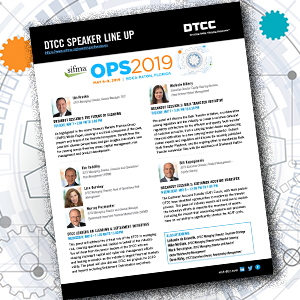 To see the full line up of panels and DTCC speakers, please click on image below.